The Budapest Marathon is part of a 2-day festival all about running. On Sunday the focus is on the marathon, however, you may also run 30 km, a marathon in a team of 4, or a 10 km. While on Saturday the focus in on a shorter distances for the less experienced runners. With distances ranging from 400 m to 42 km everyone in the family can find their own challenge and take part in the running festival. Participating in the marathon is essentially a running sightseeing tour of the beautiful Budapest. 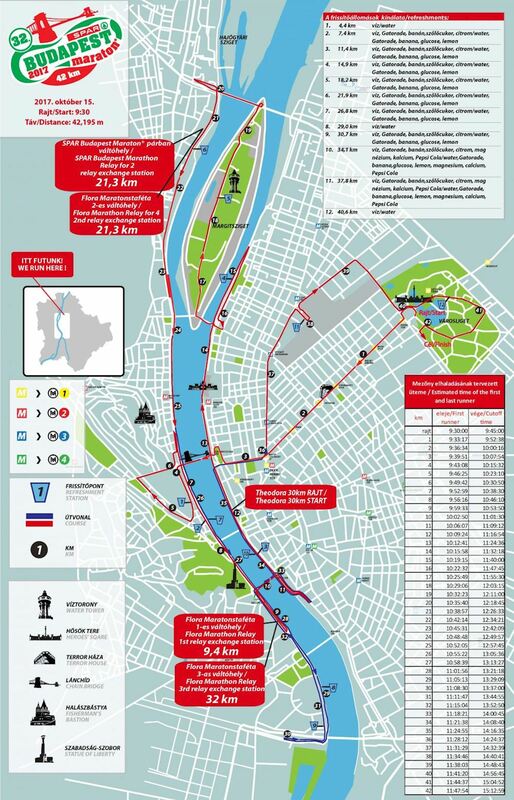 The course leads through the center of the city, down the famous Andrassy Boulevard and across the chain Bridge. Admire the view of the Buda Castle from the Danube banks and marvel in the panoram of Pest as well as Europe's third largest Parliament building. Along the course there will be refreshments every 3 to 4 km and of course continuous medical supervision. Each year participants receive a unique, race branded technical T-shirt and finishers are given a gorgeous medal. You can deposit your belongings in a spacial deposit zone before the race near the start/finish and have them back after the finish. The time limit is 5 hours and 30 minutes for marathon and 30 km. 1 hour 15 minutes for 10km. There will be 12 refreshment stations along the course, making sure that you acquire the necessary amount of liquid during the race. The First and last station will provide water while all other stations will offer banana, lemon, glucose, isodrink and water. All stations will be supplying water to wet sponge. The timing measurement is done by bib-tag. Really enjoyed this race, great and small little atmosphere which takes you around everywhere in Budapest with some great views. Really enjoyed this race, great and small little atmosphere which takes you around everywhere in Budapest with some great views. Zig zagging across Budapest's bridges was quite a cool highlight for me! Very unusual distance. This is what marathonists call mental half of the marathon, this is where the "wall" is. Very well organised, great communication and refreshment stations throughout - a beautiful city to run through! Very well organised, great communication and refreshment stations throughout - a beautiful city to run through! In 2017 I ran in Budapest twice. Polmaraton in April and in October my third marathon, which I managed to break into a new personal record. I like Budapest, and if it is possible, I will be glad to co... In 2017 I ran in Budapest twice. Polmaraton in April and in October my third marathon, which I managed to break into a new personal record. I like Budapest, and if it is possible, I will be glad to come back again. The course guides the runners through the most beautiful parts of the city passing by famous buildings like the Opera House or the Parlamient, participants run along both sides of the city (Buda and Pest) along the river Danube. The course runs through the heart of Budapest, crosses several bridges and passes the most well-known sites of the city. The course will start at the 12.195th meter of the marathon course and follow the same route to the finish. The course runs in the heart of Budapest passing several of the most well-know sites of the city. The first Budapest Marathon was organised in 1984. During the last 28 years the race grew up into a major event in Budapest with 19 000 runners. 4300 runners on the individual 42 km distance, the others are in teams or run the shorter distances. Budapest Marathon also become a real international event with 2 650 runners from abroad, from more than 60 different countries.